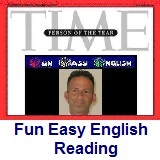 ﻿ Fun Easy English - reading practice and learning about the holiday Purim. This is a reading comprehension lesson to test your ability to understand information written in English. Read the information below and then answer the 5 test questions. Purim (Hebrew: פּוּרִים Pûrîm "lots", from the word pur, related to Akkadian pūru) is a Jewish holiday that commemorates the deliverance of the Jewish people in the ancient Persian Empire which was forming a plot to destroy them. The story is recorded in the Biblical Book of Esther (Megillat Esther). According to the Book of Esther, Haman, royal vizier to King Ahasuerus (presumed to be Xerxes I of Persia), planned to kill all the Jews in the empire, but his plans were foiled by Mordecai and his adopted daughter Queen Esther. The day of deliverance became a day of feasting and rejoicing. Purim is celebrated by giving reciprocal gifts of food and drink (mishloach manot), giving charity to the poor (mattanot la-evyonim), a celebratory meal (se'udat Purim), and public recitation of the Scroll of Esther (kriat ha-megillah), additions to the prayers and the grace after meals (al hannisim). Other customs include drinking wine, wearing of masks and costumes, and public celebration. Purim is celebrated annually according to the Hebrew calendar on the 14th day of the Hebrew month of Adar (Adar II in leap years), the day following the victory of the Jews over their enemies. In cities that were protected by a surrounding wall at the time of Joshua, Purim is instead celebrated on the 15th of the month on what is known as Shushan Purim, since fighting in the walled city of Shushan continued through the 14th. Today, only Jerusalem celebrates Purim on the 15th. This is a fun Jewish holiday. The story is really interesting. Read the information above. In the test questions below choose which is the best answer for each question. There are 5 questions. Good luck. 1. Purim commemorates the deliverance of the Jewish people in which empire? 2. The story of Purim is recorded in which of the following? 3. Purim customs include all but which of the following? 4. Purim is celebrated annually according to the Hebrew calendar on which of the following dates? 5. Fighting continued through the 14th in which walled city?